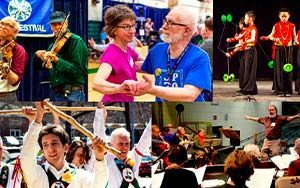 Widely known by the name NEFFA, the New England Folk Festival is an annual folk festival that blends dance, music, crafts, and food from many different places and cultures. They are excited to introduce their 75th festival from Friday April 12th to Sunday April 14th with lots of exciting things happening! Run by the New England Folk Festival Association, this organization is cultural and educational, volunteer-run, and non-profit. NEFFA organized the New England Folk Festival to bring people of all ages and backgrounds to engage with music, dance, and folk arts culture. There is music everywhere, you will find jam sessions in the halls, instrument workshops, group singing, and performances of folk music throughout the Festival as well as participatory dance, which includes a lot of contra and traditional square dancing, international folk dancing, couple dancing, waltzing, English country, Scandinavian, and more. The New England Folk Festival has several areas for vendors to sell their products such as food, crafts and handmade items, and folk merchandise that can include music CD’s, jewelry, puppets, and more. Check out the Vendor Opportunities section on their website at www.neffa.org/folk-festival/new-england-folk-festival to contact the appropriate person for each area and become a vendor. Spots have already filled up for this year, but make sure to save the date for next year and have your application in by December to secure a spot.